The story so far, The Redhood has gone on an undercover mission to take down Black Mask's criminal organization in Gotham. With Batman's help and blessing, Redhood (Jason Todd) staged a confrontation with Batman, to get on Black Mask's radar and get recruited by him to find out how far he is willing to go to expand his criminal empire in Gotham. Once Redhood manages to "get in good" with Black Mask's organization, he is tasked to hijack a train that is carrying a "game changing" weapon. During the heist, Redhood manages to run into the Amazon, Artemis. Artemis is on a mission of her own, she is trying to recover the "Bow of Ra," an ancient weapon she has coveted for a long time (possibly centuries). She was denied the weapon by the Goddess Nephthys, whom told her that she wasn't ready to possess it at that certain time, and seems to have been chasing it ever since. Artemis and Redhood initially engage in battle with one another, only to realize that each is on a righteous quest of their own, and would possibly be more helpful if they worked together. Story - 5: So far there have only been three issues of this title released. The Rebirth Special being the first followed by issues 1 & 2. So it's an easy jumping on point. And I recommend this to anyone that has been a fan of these characters in the past. Lobdell is a writer that prefers the "slow burn" when it comes to his stories. And he is usually successful at it, especially when he is writing secondary characters such as these. Lobdell initially wrote Red Hood & The Outlaws when the New 52 began, which turned out to be a good title. So it's good to see that he is able to carry on that here in the Rebirth era. I'm enjoying the slow pacing so far, and the general direction the books headed. I can already see a bit of a love affair waiting to happen between Redhood and Artemis. And will be interesting to see what the team dynamic is once Bizarro is part of the team. I like how this book is in direct contrast to the upcoming Trinity title coming soon. Redhood, Artemis and Bizarro are somewhat of a "Dark Trinity". Whom have all played the hero and the villain (he's Bizarro has been the hero of some tales in the past). It should be interesting to see how that goes, and weather the Trinity of Superman, Batman and Wonder Woman eventually turn up in any opposing manner to this team. To quickly wrap up the story part of the review, I've always been very skeptical of the resurrected Jason Todd as a character, especially back when Judd Winick (following Jeph Loeb after Batman: Hush) bought him back as the Redhood. Though I liked the story, I always felt that DC editorial should have left him dead. His death had such a big influence on Batman and his world. He was a constant reminder that Batman had failed to protect Robin, and that a Robin had died under his watch. It was really Scott Lobdell that changed my mind, when he wrote Jason as an anti-hero, who had become more like the Punisher than Batman. So I like where the direction he is headed in now, especially how he still tries to impress and do Batman proud. I also really liked the fact that Artemis giant axe "Mistress" is very much similar to Thor's hammer Mjolnir. It comes when she calls. 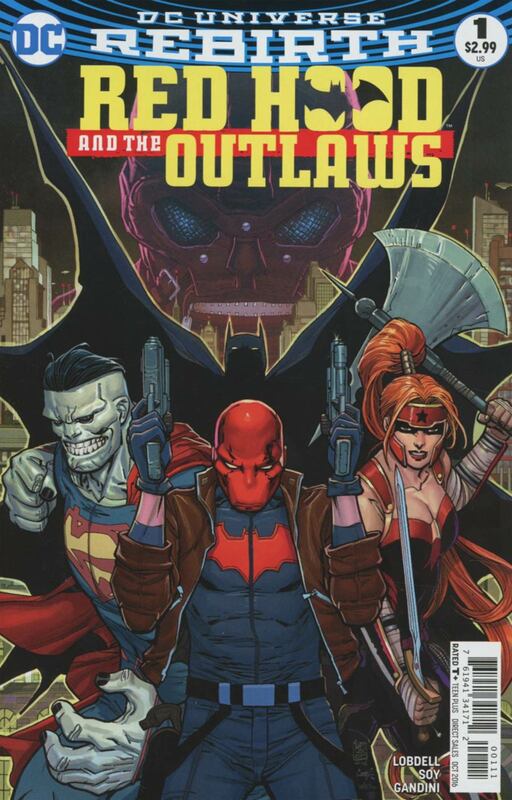 Lobdell has made me eager to read the further adventures of Redhood and his Outlaws. So mission accomplished there DC. Art - 5: The art in this book is really, really good. It is a perfect marriage with the writing and tone of this series. The manga influence and the dark shadowed grittiness make it a real treat every issue. Dexter Soy has evolved from a good illustrator to a great visual storyteller. I really am amazed at how good he has gotten from the last project I saw his work on, which was Masters of the Universe VS DCU. Here Dexter is simply just handling the art duties, and not coupling that with coloring. Which I feel the art appears sharper for it. Dexter has a great sense of style when it comes to setting the mood for a scene or sequence. He has handled all three issues so far, and the art hasn't suffered. So I really hope he is able to keep at this pace, and finish whole storylines, before taking a break. The redesigned look for Redhood is just as good looking as what Kenneth Rocafort designed when he started the book with Lobdell at the beginning of the New 52. There is a natural evolution in his design. Artemis has a very cool sleek redesign too. She has familiar Wonder Woman tropes to her costume, such as the head gear with the familiar star adorning her forehead. White stripes down the centre of her boots. Gauntlets (not to be mistaken for bracelets). And of course the chest armor. However along with these elements, she also has a very modern look, with the pants. I know that Wonder Woman had pants at one stage, which caused a huge stir. But they work for Artemis, most probably because she is a secondary character, and fandom won't make a huge deal about it. We have only really gotten a small glimpse of Bizarro so far, and from that one page, we know that he has the exact same suit as the Rebirth Superman. I hope that the look evolves further and that he doesn't just have a Superman suit, with slightly mutated colors and a backwards "S" insignia. There also needs to be an explanation as to why Bizarro has the same costume as Rebirth Superman, and not the body armor of the New 52 Superman? Assuming that this Bizarro is a clone of the new 52 Superman, because there really can't be a way he is a clone of rebirth Superman. Lastly let me quickly comment on colorist Veronica Gandini's palette. She is simply amazing! I especially loved her issue #1 flashback sequence, all done in grey, except for Jason Todd's red hooded sweatshirt. You instantly knew from looking at the pages, that that was a young Jason Todd. Her separations and other color effects are outstanding. Really fits the tone and look of this book. Cover Art - 4: The main covers don't do the book justice I'm afraid. The variants done by Matteo Scalera and Moreno Dinisio are a lot better, though I'm not too fond of their Bizarro. I'd love to see them as regular cover artists, or hopefully fill in artists when Dexter Soy needs a break.